2011 Kaukauna High School graduate Tanner Agen. Photo via Facebook. 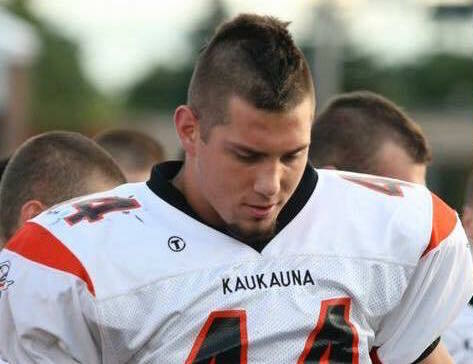 KANSAS CITY — Tanner Agen, a 2011 Kaukauna High School graduate who played defensive tackle in college at Michigan Tech, has been invited to tryout with the Kansas City Chiefs, according to NFLDraftRumors.com. Agen was contacted shortly after the 2016 NFL draft wrapped up Saturday in Chicago. First weekend after the NFL Draft: clubs may elect to hold their one three-day post-draft rookie minicamp from Friday through Sunday or Saturday through Monday. Rookie Football Development Program Begins. Second weekend after the NFL Draft: clubs may elect to hold their one three-day post-draft rookie minicamp from Friday through Sunday or Saturday through Monday. Earlier: April 27, 2016 KAUKAUNA — The 2016 NFL draft gets underway Thursday, and although Kaukauna’s Tanner Agen doesn’t expect to hear his name called on day one, he’ll be watching closely none the less. That’s because after the reality show that is the NFL draft comes to a close, teams get down to serious business to fill out their rosters. That’s where plenty of prospects get their chance to catch on with a team. Agen, a 2011 Kaukauna High School graduate, finished a standout career at Division 2 Michigan Tech and graduated in December to begin focusing on the possibility of a pro career. A strong performance at the Dream Bowl, a showcase bowl for smaller school players, has caught the eye of a few more NFL scouts. Aaron Wilson, who covers the NFL for the National Football Post, tweeted Monday that Agen is drawing interest from the Green Bay Packers, along with the Kansas City Chiefs and the San Franciso 49ers. Most reports have Agen being picked up and signed as a free agent following the draft. Bob McGinn of the JSOnline noted that Agen turned out a remarkable 42 reps on the bench press at Michigan’s pro day. That’s a hefty chore for any prospect. “He did the bench 42 times, which was good, but the game’s about a lot more than just hitting the bench press,” one scout told McGinn. “He’s a tough, try-hard guy that’s strong. He put together a good season in the GLIAC (Great Lakes Intercollegiate Athletic Conference). He may get a rookie tryout, but that’s probably about it. “I’d make him an offensive lineman,” said another scout. Listen to a podcast interview with Agen HERE. See his high school highlights HERE. See his college highlights HERE.